Goal! Sky Blue 1, Chicago Red Stars 3. Samantha Kerr (Sky Blue) right footed shot from very close range to the bottom right corner. Assisted by Leah Galton. Delay in match Kelley O'Hara (Sky Blue) because of an injury. Attempt missed. 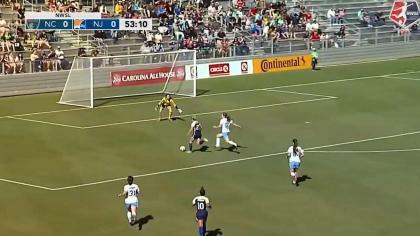 Christie Rampone (Sky Blue) right footed shot from outside the box misses to the right following a set piece situation. Substitution, Sky Blue. Kelly Conheeney replaces Taylor Lytle. Attempt missed. Amanda Da Costa (Chicago Red Stars) header from very close range is close, but misses to the right. Assisted by Arin Gilliland with a headed pass following a corner. Attempt missed. Kelley O'Hara (Sky Blue) right footed shot from outside the box is high and wide to the right from a direct free kick. Attempt missed. Samantha Kerr (Sky Blue) right footed shot from outside the box is too high. Assisted by Kelley O'Hara. Goal! Sky Blue 0, Chicago Red Stars 3. Sofia Huerta (Chicago Red Stars) left footed shot from very close range to the bottom right corner. Assisted by Arin Gilliland with a headed pass following a corner. Corner, Chicago Red Stars. Conceded by Sarah Killion. Goal! Sky Blue 0, Chicago Red Stars 2. Christen Press (Chicago Red Stars) right footed shot from the centre of the box to the bottom left corner. Assisted by Vanessa Di Bernardo with a through ball. Attempt missed. Vanessa Di Bernardo (Chicago Red Stars) left footed shot from outside the box misses to the right. Assisted by Christen Press. Attempt missed. Vanessa Di Bernardo (Chicago Red Stars) right footed shot from outside the box is just a bit too high. Assisted by Christen Press. Substitution, Chicago Red Stars. Alyssa Mautz replaces Stephanie McCaffrey because of an injury. Attempt missed. Samantha Kerr (Sky Blue) left footed shot from outside the box misses to the left. Attempt missed. Taylor Lytle (Sky Blue) right footed shot from outside the box misses to the left. Dangerous play by Stephanie McCaffrey (Chicago Red Stars). Attempt missed. Natasha Kai (Sky Blue) right footed shot from very close range is too high. Natasha Kai (Sky Blue) hits the bar with a header from very close range. Assisted by Leah Galton with a cross. Substitution, Sky Blue. Kelley O'Hara replaces Erin Simon. Attempt missed. 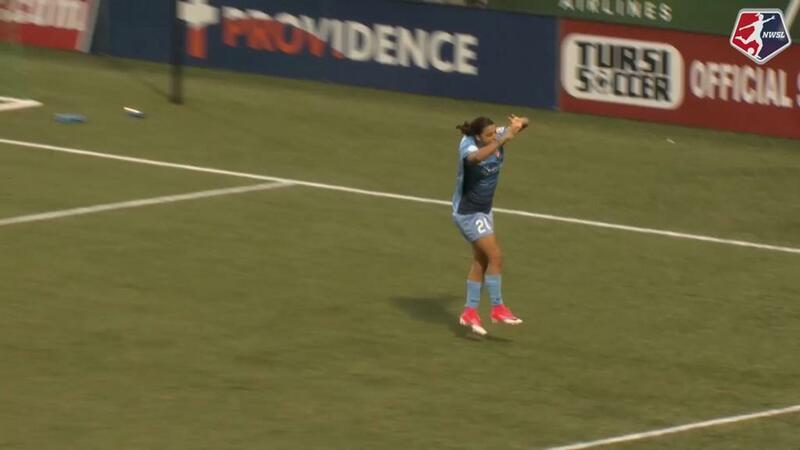 Sofia Huerta (Chicago Red Stars) right footed shot from the right side of the box misses to the left. Assisted by Stephanie McCaffrey. Attempt missed. Vanessa Di Bernardo (Chicago Red Stars) left footed shot from outside the box is too high. Assisted by Christen Press. Offside, Sky Blue. Natasha Kai tries a through ball, but Sarah Killion is caught offside. Attempt blocked. Natasha Kai (Sky Blue) left footed shot from the centre of the box is blocked. Attempt saved. Sarah Killion (Sky Blue) left footed shot from very close range is saved in the centre of the goal. Attempt saved. Sarah Killion (Sky Blue) right footed shot from the centre of the box is saved in the centre of the goal. Attempt missed. Christen Press (Chicago Red Stars) right footed shot from the centre of the box is too high following a corner. Attempt blocked. Natasha Kai (Sky Blue) header from the centre of the box is blocked. Assisted by Sarah Killion with a cross. Attempt saved. Raquel Rodríguez (Sky Blue) left footed shot from the left side of the box is saved in the top left corner. Assisted by Natasha Kai. Goal! 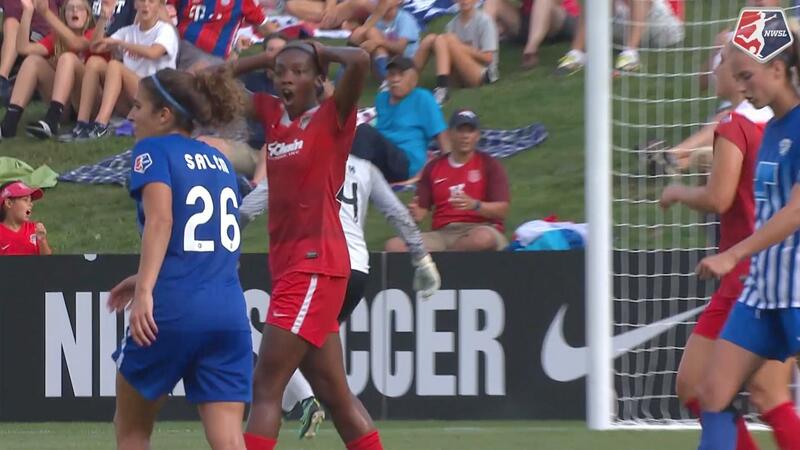 Sky Blue 0, Chicago Red Stars 1. Stephanie McCaffrey (Chicago Red Stars) right footed shot from a difficult angle and long range on the right to the bottom left corner. Assisted by Arin Gilliland. Attempt saved. Natasha Kai (Sky Blue) left footed shot from outside the box is saved in the bottom left corner. Assisted by Leah Galton with a cross. Attempt missed. Christen Press (Chicago Red Stars) left footed shot from outside the box is high and wide to the left. Assisted by Arin Gilliland. Attempt saved. Vanessa Di Bernardo (Chicago Red Stars) left footed shot from the right side of the box is saved in the centre of the goal. Attempt saved. Stephanie McCaffrey (Chicago Red Stars) right footed shot from outside the box is saved in the top right corner. Assisted by Cara Walls. Attempt saved. Christen Press (Chicago Red Stars) left footed shot from outside the box is saved in the top centre of the goal. Corner, Chicago Red Stars. Conceded by Christie Rampone. Attempt blocked. Cara Walls (Chicago Red Stars) left footed shot from the centre of the box is blocked. Assisted by Christen Press with a cross. Attempt saved. Sofia Huerta (Chicago Red Stars) right footed shot from the right side of the box is saved in the bottom left corner. Attempt blocked. Christen Press (Chicago Red Stars) left footed shot from outside the box is blocked. Assisted by Vanessa Di Bernardo. Attempt saved. Cara Walls (Chicago Red Stars) right footed shot from outside the box is saved in the centre of the goal. Assisted by Stephanie McCaffrey. Cara Walls (Chicago Red Stars) wins a free kick on the left wing.